the 'generators' engine was patched to resolve an error that had prevented the generation of a file selected with the 'choose folder' option. the bug, that is now fixed in version 1.06, did not affect the generation of a file from a pre-configured 'foldatimeICASoptions' folder. the bug also had no effect on clipboardICAS. there are no changes to the methods of configuration of options files from the previous version. the folder and file objects generated by foldatimeICAS are now written with a 2nd decitriad to the microchron (for example, tTTT ttTTT). earlier versions of foldatimeICAS were written with only a 1st decitriad to the millichron (for example, tTTT). the foldatimeICAS AppleScript application bundle generates folder and file objects that are named with both user-specified and OS-extracted information. for detailed information about user configuration of options for foldatimeICAS, please see the configuring options documentation for foldatimeICAS. the folder name format designates a zoneDeka system of 20 time zones. the file name format however designates a zoneZodiac system of 24 typical time zones. there is no automated format unit chooser for the naming of folder and file objects, however some formatting can be configured by managing the names of certain options files. as any folder in the Mac OS must have a name that is unique for its location, it is important to ensure that an identical foldatimeICAS folder name does not already exist on the desktop. as the folder and file formats are expressed to the microchron, such a situation is unlikely to occur with normal use of foldatimeICAS. if however, a folder with a pre-existing filename exists, then a preliminary folder name, of the format xYUDD-tTTT-ttTTT will appear on the desktop. if the preliminary folder name does not change to the designated folder name format after the application has run, then troubleshooting might begin with checking the file path to the desktop folder used by foldatimeICAS. in any case, it is a good idea to test run foldatimeICAS and check that the designated format options are being written to the folder and file names. so zoneDeka local time set to UT. zoneZodiac (24 typical zones) time is however set according to System Preferences. to disable the default options alert, configure a valid option for a local zoneDeka time zone by installing options resources for the option types dekaOffset and dekaLocale as described in the configuring options document. 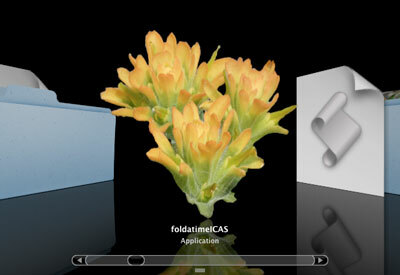 foldatimeICAS looks for certain types of options files in the foldatimeICASoptions folder that a user has installed in the the Documents folder of the users home folder. the application extracts options information from the name of an option type file. please refer to the configuring options document for detailed information. the local zoneDeka time options for foldatimeICAS and clipboardICAS are configured with TWO and only TWO option types: dekaOffset and dekaLocale. both options must be installed correctly to avoid the default mode configuration of UT for the local zoneDeka local time zone. the default mode also forces the display of the default options alert upon launch of the application. for example, if a user wishes to designate an offset option for dekaOffset[-07](UT-0.3).txt, then the user needs to ensure that a corresponding locale option such as dekaLocale[-07]San Francisco.txt is also installed. both correspond to the same [-07] time zone identifier. option files that begin with the string affixID will be parsed for a text value (from characters 09 and following) to identify a text value for a folder affix. examples of folder affix text include: 'new', 'items', 'flag', and so forth. option files that begin with the string fileID will be parsed for a text value (from characters 08 and following) to identify a file name prefix. examples of file name prefix text include: 'about', 'index', 'items', 'list', 'notes', and so forth. option files that begin with the string folderID will be parsed for a text value (from characters 10 and following) to identify a folder name prefix. examples of folder name prefix text include: myName, myProject, 'images', 'songs', 'items', 'list', 'notes', and so forth. option files that are named myFile (with any user-selected file type extension) will enable foldatimeICAS to generate a copy of the file in the generated folder, and then rename it with a designated folderID with date and time string. foldatimeICAS will also call on the file to be opened (with the default application assigned for a particular file name extension). if no myFile option is specified, then foldatimeICAS will not generate a file. it will only generate a folder.